In my post about Gymnastics Strength Training, I briefly mentioned the idea of tempo. I believe this aspect of training often goes unnoticed, and deserves to be highlighted in more depth. It’s incredibly easy to add more weight to a compound movement, which is an objective means of measuring absolute strength gain, and visibly show progress. It’s also much sexier to show this with novelty Crossfit plates which may or may not be deceptively lighter than you think they are. This logic holds because, well, most of the time if you’re able to lift heavy weight – there’s a higher likelihood of you being stronger (absolutely) than someone who lifts less. However, there are also other factors which can dictate and improve relative strength. What I’m talking about is control, and I believe control is synonymous with being skilled when working at different tempos. You simply can’t have one without the other. A good starting point for improving your control involves making use of isometric contractions. This is the physiological way of explaining a muscle contraction, where the muscle itself does not lengthen nor shorten; it remains fixed in one position. 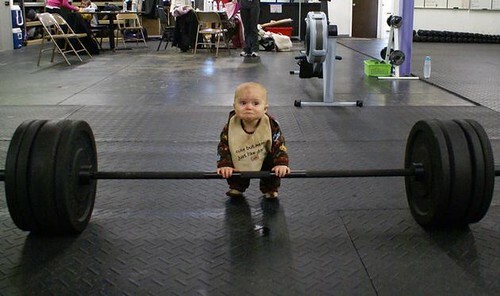 Under normal circumstances when performing a basic exercise such as a chinup, we tend to do it quickly. You may spend one second pulling up (concentric part), half a second at the top of the bar, and another second dropping and hanging at the bottom (eccentric part). The downside with this approach is that the exercise is approached as a whole, instead of in three distinct phases: the bottom, middle, and top. 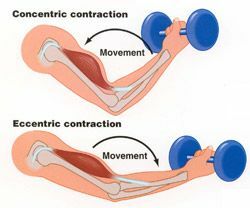 Refer to this image to see the difference between the concentric and eccentric movements. I believe that approaching an exercise as a whole, instead of in parts, can significantly hinder your ability to become stronger and more capable with performing that exercise. Now imagine if you were a personal trainer and were given the responsibility of improving a client’s squat. By telling them to simply squat would be to ignore all the physical components which make a person squat well, such as their hip, ankle and thoracic (ability to stay upright) mobility. The logical approach would be to focus on and improve one deficiency at a time. Isometrics are no different, and serve a similar purpose. Going back to the example of a chinup, one approach (if it’s a weakness) could be to work on the middle part of the pull only, where you would hold this and only this position for a time, such as 5-10 seconds. FitnessFAQs demonstrates an assisted one arm isometric hold for the middle part below. By focusing on only one part of an exercise or movement at a time, you’re putting yourself in a position to specifically target weakness(es) and address them. This approach will prove especially useful if you’re experiencing a plateau, requiring you to strip back your training to assess what can be done to continue to move forward. Now that I’ve spoken about control, let’s talk about tempo. If you want to accurately measure your training and progression, tempo can be tricky to nail down. We often use expressions like do it slow and controlled, which is OK at the time, but doesn’t help you much if you’re looking back to see how this tempo has evolved over weeks or months. In the context of not approaching an exercise as a whole, I’ll define tempo as the amount of time it takes us to do one part of an exercise. Here’s a proposed method I’ve always used to measure tempo, which breaks an exercise down into four components. Each of these components is allocated a number, in seconds, which dictates how long you will perform it. Lower the bar down for 4 seconds, pause at the bottom for 2 seconds, explosively (X) push up as fast as you can, and hold the bar at the top for 1 second. Lower yourself down for 4 seconds, pause at the bottom for 2 seconds, explosively (X) pull up as fast as you can, and hold yourself at the top for 1 second. Therefore, to successfully track your tempo changes would mean to alter the above numbers over a training cycle. Got a 4 second eccentric one week? How about trying to work up to 6-8 second eccentrics in the following weeks. This can quickly become difficult, especially when performing bodyweight exercises. In my training, altering tempo was particularly important when working towards a one arm chinup. The below video demonstrates weighted one arm chinup eccentrics. Changing up tempo in your training will present new opportunities for strength gain, added difficulty, and even more fun with what you’re doing – give it a try!